Abstract: This review summarizes the added value of local anesthetics in patients undergoing craniotomy for brain tumor resection, which is a procedure that is carried out frequently in neurosurgical practice. The procedure can be carried out under general anesthesia, sedation with local anesthesia or under local anesthesia only. Literature shows a large variation in the postoperative pain intensity ranging from no postoperative analgesia requirement in two-thirds of the patients up to a rate of 96% of the patients suffering from severe postoperative pain. The only identified causative factor predicting higher postoperative pain scores is infratentorial surgery. Postoperative analgesia can be achieved with multimodal pain management where local anesthesia is associated with lower postoperative pain intensity, reduction in opioid requirement and prevention of development of chronic pain. In awake craniotomy patients, sufficient local anesthesia is a cornerstone of the procedure. An awake craniotomy and brain tumor resection can be carried out completely under local anesthesia only. However, the use of sedative drugs is common to improve patient comfort during craniotomy and closure. 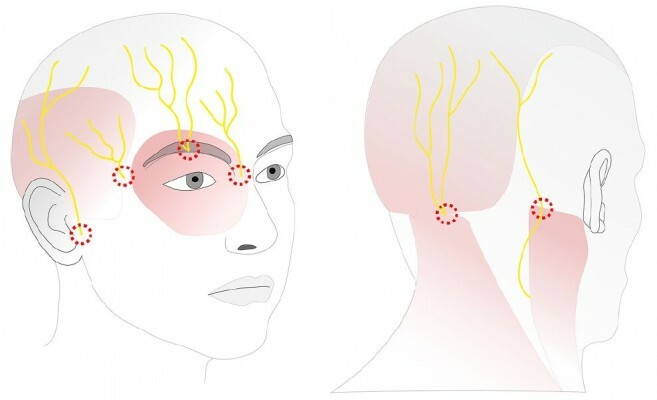 Local anesthesia for craniotomy can be performed by directly blocking the six different nerves that provide the sensory innervation of the scalp, or by local infiltration of the surgical site and the placement of the pins of the Mayfield clamp. Direct nerve block has potential complications and pitfalls and is technically more challenging, but mostly requires lower total doses of the local anesthetics than the doses required in surgical-site infiltration. Due to a lack of comparative studies, there is no evidence showing superiority of one technique versus the other. Besides the use of other local anesthetics for analgesia, intravenous lidocaine administration has proven to be a safe and effective method in the prevention of coughing during emergence from general anesthesia and extubation, which is especially appreciated after brain tumor resection.